Cruise Vs. All-Inclusive: Which Is Better? 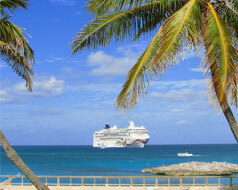 Cruises and all-inclusive resorts are both great ways to spend your vacation. But if you don’t know which one will fit your vacation style best, it may be hard to decide how you want to see the world. So, here are a few insights to help you narrow down which one fits your method of retreat. A cruise is the perfect way to see multiple cities or islands while only unpacking once during the entire vacation. Basic cruises (not the luxury style ships) include accommodations, meals and some beverages, pool, kids programs, evening entertainment, and stops at different ports. For newer built or recently remodeled ships, the cruise may offer rock climbing walls, zip lines, water attractions, or ropes courses. Other activities such as Broadway shows, comedy and magic acts, and movies may also be offered. *Some activities such as spa treatments and specialty dining require a fee. This is one of the most secure and safest ways to travel because there is controlled access, anti-terrorism measures, trained security, surveillance cameras, and port security. There are always activities happening on a cruise and multiple activities going on at once, especially during the sea days. When the ship lands at port, multiple shore excursions are offered. You can choose to participate in a variety of activities or nothing at all. Adults aren’t the only ones pampered. Children can join kids or teen clubs that have activities catered specifically to their age group. There are also activities for the whole family to enjoy together. There is a change of scenery every day. Even on the sea days, cruise itineraries are full of choices. The price of an all-inclusive resort includes meals, beverages (alcoholic and non-alcoholic), accommodations, non-motorized water sports, access to a well-kept beach, live entertainment, and tips and gratuities. *Amenities vary by resort. Check with your travel agent to see what is included in your resort choice. Your resort includes all the essentials you need for a comfortable stay. It is definitely a beneficial vacation as you don’t have to take out your wallet for every transaction because everything is included. Most resorts offer a kid’s club or program. Think of it as a luxury summer camp with various activities from yoga to art to cooking. All-inclusive resorts are also perfect for those who are content to stay at the beach all day and don’t want to worry about going anywhere or do anything. You will have the opportunity to experience the culture of your destination well as you will not be moving from place to place. Whether you choose a cruise or an all-inclusive resort, you can’t go wrong as the service is exceptional. The price of a cruise or an all-inclusive depends on factors such as dates of travel, location, and features and amenities of the resort or cruise ship. A travel agent will help you plan a great quality vacation with a fantastic value. In the end, it is up to your personal vacation style and preference which one you decide.